An old adage says that, if you have to walk through a dark and dangerous place, you should ‘talk quietly, and carry a big stick’. The government – and the foreign secretary in particular – seem to have modified this advice somewhat, by talking aggressively whilst carrying a twig. The one reality that no-one seems to have raised about Britain’s aggressive stance over Syria is that the UK is in no position to use military force against the Assad regime. Compared with the minimum number of about 300 cruise missiles needed to have a material effect, Britain can deploy a maximum of perhaps eight from a single Trafalgar-class submarine. Adding a handful of Tornadoes to this would make little or no difference. After the Labour administration stripped the Navy of its aircraft, the present government has completed the job by taking away the carriers as well. What are we supposed to attack Assad with? One cannot fail to admire David Cameron for his principled anger over the use of chemical weapons. His government is right to articulate anger, but not to threaten. It is difficult to imagine an action more heinous than gassing innocent civilians. Indeed, the only worse crime that comes to mind is that of carrying out a nuclear murder on foreign soil, heedless of the risk to innocent bystanders. Prior to the Syrian affair, though, William Hague’s most assertive language had been reserved for the Ecuadorians. Many parallels have been drawn between the Syrian crisis and the invasion of Iraq. At least, in that instance, the then government had the partial excuse of being influenced by a gung-ho American administration. It is to be hoped that the Iraq invasion will one day make it to the silver screen. Given Hollywood’s love of sequels, The Madness of President George seems an obvious title. This time around, Washington seems significantly more measured, and has provided no prompting for the aggressive language used, most noticeably, by Hague. France, of course, has been equally assertive, but the French do at least have an aircraft carrier to send. If talking quietly and carrying a big stick is good advice, the most important step should be to recover the stick. This can happen, at the end of this decade, if both of the new carriers enter service, suitably funded and equipped with full complements of aircraft. Until then, talking quietly should be the order of the day. 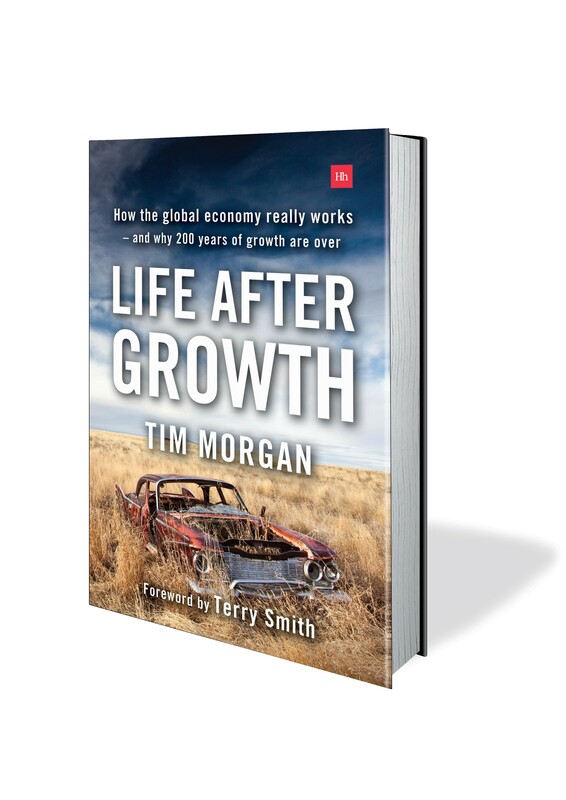 As regular readers will know, my book Life After Growth is getting ever nearer to publication. The latest step towards publication is the completion of the cover. I think publishers Harriman House have produced a really exciting design, and hope you’ll like it as much as I do! 14. An end or a beginning? Conclusion – what does this mean to me? I’ll keep you posted here – meanwhile, though, if you’ve any questions, do let me know…..
No wise person criticises cats for trying to catch mice. It’s what they do. It’s part of the job description for being a cat. Likewise, we should expect politicians to try to win elections. But this does not mean that we should watch their electoral manoeuvrings without comment, particularly where those activities are gravely damaging to the general public. – Over the last ten years, the annual disposable income of the average British wage-earner has increased by £2,080. – Over the same period, average household debt has increased by £28,300. Now I know that the average worker and the average household are not quite the same thing, but they are close enough for this to be a valid comparison. Some households are workless, and some are retired, but it’s difficult to rack up debt without an income, so the comparison is close enough. Since 2002, then, average household debt has increased by £13.60 for each £1 increase in average disposable incomes. And now George Osborne wants people to borrow more? Yes, he does. The “Funding for Lending” scheme is intended – I quote government here – to “create incentives for banks to increase their lending to UK households”. ”Help to Buy”, meanwhile, will guarantee up to 20% of the cost of buying properties up to a maximum price of £600,000. (Just for the record, average property prices are £168,000 in Britain as a whole and £287,000 in Greater London, so this isn’t aimed at first-time buyers). Let me explain my figures here. Between 2002 and 2012, average wages increased by £6,480 (36%), from £17,910 to £24,390. Of this nominal increase, however, £4,400 (68%) was eaten up by the 62% increase in the cost of essentials (as measured by the TM UK Essentials Price Index), leaving disposable incomes just £2,080 (19%) improved. Second, average mortgage and credit debt per household increased by £28,300 – from £31,510 to £59,810 – over the same period. Let’s remember how often the Conservatives and the Liberal Democrats have accused Ed Balls of trying to borrow Britain’s way out of a debt crisis. It’s a valid criticism. But now, instead of the state loading up on debt, as Labour would have liked, households are going to do the borrowing instead. Either way, then, the panacea to a debt-burdened economy is more borrowing. The logic, of course, is that rising house prices will make consumers more relaxed about loading up on credit, giving the economy a Brown-style ‘borrowed growth’ spurt in time for the election. Two questions surely have to be asked – will it work? And should it? Well, pumping up a credit bubble ahead of an election has worked before. This time, however, we ought to take note of what is happening in bond markets, which could wrest control of interest rate policy out of central bankers’ hands long before the 2016 “guidance” date for the continuation of cheap money. As for whether it should work, I’ll leave that to you. But my sympathies will be with first-time buyers when – and, I emphasise, when, not if – rates rise from their historic lows. Anyone sucked into taking on debt over the coming couple of years is likely to learn, the hard way, that anyone supping with the official line on monetary policy should do so with a very long spoon. As savers, of course, have already learned to their cost. #3 Can we earn, or must we borrow? If you ask them – or, indeed, even if you don’t – Ministers will tell you that the British economy is improving. Of late, they even have some figures to back up this claim. The opposition, naturally, sees things differently, and has scored a bulls-eye with the publication of House of Commons Library statistics on comparative real wages in the European Union. This impartial assessment shows that, after inflation, the average British worker is 5.5% worse off now than he or she was when the Government took office in mid-2010. By this undeniably-important measure, only the Greeks, the Portuguese and, perhaps oddly, the Dutch have fared worse. Even in Spain, real wages have fallen by less (3.3%) than they have in Britain. Using figures from the Office for Budget Responsibility (OBR), Labour has calculated that average real wages will continue to fall between now and the 2015 general election. The Labour implication, of course, is that wage-earners would have fared better if Ed Balls had been in charge. This is a pretty doubtful proposition given the shadow chancellor’s preference for borrowing Britain’s way out of a debt problem. Even if we reject the opposition’s prescription, though, we can hardly deny their diagnosis. Taking a somewhat longer horizon, we need only compare the rise (of 10%) in nominal wages between 2007 and 2012 with official CPI inflation over that period (16%) to accept that working people have become poorer. My preferred take on this is to compare the 10% rise in wages, not just with CPI, but with a basket of essentials, which increased by 33% over those five years*. The divergence between wages on the one hand and the cost of essentials on the other bears hardest on low earners, because they spend a higher-than-average proportion of their incomes on essentials. The other hard-hit group, of course, are savers, who will have derived no comfort at all from the Bank of England’s newly-stated commitment to keeping interest rates at rock-bottom for a period that is likely to be at least three years. Like savers, then, wage-earners have become poorer, not just over three years but over a longer period, and Labour is probably right to argue that this trend will continue. What are we to make of the apparent improvement in the economy? Well, I’m afraid it looks like a case of reversion to type – a return to borrowing as the basis of “growth”. The Government is committed to “helping” first-time home buyers (though you might think, as I do, that enabling people to acquire interest rate exposure in order to buy over-priced properties is a strange kind of “help”). The idea, of course, is that bolstering the property market will make people more relaxed about taking on additional credit, thereby boosting consumption despite continuing weakness in real wages. What it all boils down to is this. If Ed Balls had had his way, the state would have borrowed more, whereas, under George Osborne, consumers will do the borrowing instead. Either way, the conclusion seems to be that the only way that the British economy can grow is by borrowing. Depressing though it is, this analysis seems valid – even in the so-called “boom” years under Gordon Brown, household and government debt grew by a lot more than the economy. There’s a parallel here, too, with the banks. In the bad old days before 2008, the banks grew their “profits” by trashing their balance sheets and, according both to the Conservatives and to Labour, the only way in which the country as a whole can grow is by doing the same thing. The trouble with this, of course, is that aping the banks’ behaviour on a national scale invites the same fate. If you look at the shorter-dated end of the government bond markets, particularly in the United States, you’ll see that rates are rising, which points to the nightmare that must keep Treasury officials awake at night – if the market wrests control of rates out of the hands of central banks, the most indebted countries (and individuals) are in real trouble. My solution to this would be to come at the problem from the opposite direction. Essentially, we need to boost real wages by getting inflation down. Whilst there’s not much that we can do about the prices of inputs like energy and food, we can certainly improve the mechanism which translates these variables into the average person’s experience. Coincidentally – or, I believe, not coincidentally at all – the fastest price increases are happening in sectors where competitive pressures are at their weakest. What we need, I believe, is far greater competition in sectors like transport, utilities, banks, telecoms and food retailing. On the one hand, regulation is no substitute for competition. On the other, there should always be at least a dozen major players in each important sector. So here’s the question – does anyone have the stomach for breaking up over-concentrated markets, or must consumers go on relying on borrowing rather than earning? * Those interested in such things might like to know that I’ll be continuing the Tullett Prebon index as the TM UK Essentials Inflation Index, which will be published on this web site in the future. Shale gas isn’t a road to riches. But it might be a sign of energy desperation. To the understandable concern of those living in shale-prone areas, the Government has puts its authority (and its fiscal largesse) behind the plan to use fracking (hydraulic fracturing) to extract gas from tight sands. But there is one big question about shale gas that hasn’t even been asked – why are we doing this at all? The answer should worry everyone. Of course, the reasoning behind boosting shale development might seem obvious if you believe even a fraction of the hype coming from the other side of the Atlantic. If media reporting is to be believed, shales will give the United States “energy independence”, and could even create “Saudi America”. If this is true, why wouldn’t Britain want a piece of the action? The problem is that shales aren’t all they seem. To be sure, tight sands production has boosted US gas output, to the point where prices have slumped in a market where a weak economy has depressed demand. But think about this for a moment – investment in the American shale gas industry is heading towards $2 trillion. That sum buys you a lot of wells and, not surprisingly, also buys a lot of initial production. That, of itself, doesn’t prove anything. Please note that word “initial”. Data emerging from the American shales patch strongly suggests that output falls away very rapidly indeed after start-up. Production declines are normal in the petroleum industry, of course, as pressure is dissipated and flow rates tail off. The problem is that, compared to an annual decline rate of around 7-10% from “normal” oil and gas wells, shale output seems to fall much more rapidly, perhaps by as much as 65% in some instances, in the first year of production. Fields whose production lives were reckoned to be around forty years may actually last for as few as eight. Decline rates like these put you on a “drilling treadmill” because, if you don’t keep drilling new wells, gas production falls away very rapidly indeed. Instead of developing a field over a period of two or three years and then sitting back and watching it produce, operators get caught in a “drill till you drop” syndrome if they are to have any chance of keeping investors happy. That’s bad news, of course, for locals, because it means a continuous drilling programme, not a one-off development phase. It’s bad news for the Treasury, too, because “pay-back” (the point at which taxes start to become due) will be delayed by an ongoing programme of drilling (and shale wells, incidentally, cost far more than “normal” ones). Indeed, pay-back might never be reached at all. Why, then, is Government so enthusiastic about something which, as well as being unpopular, is beginning to look a lot like an energy industry version of the dot-com bubble? Well, of course, it could be that Ministers and their officials are taking the “Saudi America” hype around shales at face value. But there’s a darker possibility, which is that Government might see shales as a short-term answer to Britain’s looming energy shortfall. Since 2007, energy consumption in Britain has dropped by 8% (from 235 million tonnes of oil-equivalent to 216 mm tonnes), which isn’t too surprising given the economic slump. From here on, though, Government expects energy demand to fall further (to 198 mm tonnes over the next ten years) even though it also expects brisk economic growth. If energy demand doesn’t fall, we’re in big trouble, as supplies are on a sharply downwards trajectory. The North Sea is critical, of course and, despite having been a net exporter until 2004, we imported close to half of our gas consumption last year. We also imported more than a third of our oil needs, even though we were net exporters until 2005. About four-fifths of our remaining coal-fired electricity generating capacity is slated for early closure, and our fleet of nuclear reactors is ageing rapidly. Even if energy demand does continue to fall, we could be in a supply squeeze by the winter of 2014-15. It has been rumoured in the media that plans already exist to cut back on gas supplies to industry in order to prevent shortfalls in the home. In short, Britain’s energy strategy, such as it is, rests on a shaky tripod of declining demand (despite assumed economic growth), a dramatic increase in the production of renewables, and an escalation in imports of gas. Let’s be clear that this Government is not to blame for most of this. Blair and Brown spent a decade ducking the need to order new nuclear power stations even when it was clear that we were facing severe energy shortfalls in the not-too-distant future. In fact, it was the pre-1997 Tory administration that allowed, not just the “dash for gas”, but exports from our vital, always-limited gas reserves in the Southern North Sea as well. But Governments must play the hand they are dealt. Late though it is, we need to order new nukes now. The type of contracts needed to get projects moving will push prices up, but that’s where prices are going anyway, and delay will only make this worse. We also need to press ahead with unpopular (but effective) solutions like extracting power from waste. But what we do not need to do is to waste tax-payers’ money on the shale chimera. First of all, I would like to welcome all visitors to my new website. If you haven’t done so yet, please do join those who have already signed up for my mailing list. I really hope that you will feel free not just to comment but also to suggest topics for discussion. There are very many issues that I’d like to discuss here and, as you might know, my blog at Tullett Prebon ranged over subjects as varied as ‘generational theft’, the 2011 English city riots, the ‘Abenomics’ experiment in Japan, the real nature of the problems in the Eurozone and, of course, the dire fiscal and economic challenges facing Britain. But my main interest, which I know is shared by many who contributed to my previous blog, is a radically new approach which recognises that the economy is, first and foremost, a surplus energy equation onto which a financial ‘corollary’ or ‘shadow’ economy has been grafted. We are never going to understand how the economy really works if we insist on thinking of it as a monetary construct. Money is the language in which economic matters are discussed, but we should never mistake the language for the substance. ……..only I haven’t (put my feet up, that is). What I’m interested in now is the next stage – “life after life after growth”, so to speak.